Wish you and Lydia a pleasent bike journey to Turkey …..
‘Prettige reis,’ means have a nice trip., to Turkey. Have fun…. All the best in your journey and will remember you and your family in prayers as you travel. Looking forward to your journal as you update them. See you and KL in months to come. Thouroughly impressed with the whole project, the photos, and most of all the decision to carry out your dream. Wishing you all the very best, and the determination to overcome the odds. I shall remember you in my prayers and visit your site with anticipation! Pleasure to have your visits. Thanks for your comments + encouragements. On pense fort à vous; On espère que tout à bien commencer pour vous 2. Vous avez l’air de bien en profiter!!! C’est super, continuez a nous faire rêver et raportez peins de merveilleux souvenirs! Bravi Sheen e Lydia !!! Wish you all the best for your long trip even if without origibnal pesto…. You are doing such a great thing – it was an excellent decision to make this journey. And it is an enourmous pleasure for us to follow your progession and share a little bid of your experiences and rencontres with you ! Hey Sheen …. Salut mon ami. I’ve finally found the time to catch up with you again. It looks as though you’re having a ‘ball’ from what I’ve just been looking at. Have gotta say I didn’t know you were 2-up with the missus. I took a ride down to see my sister a couple of days back, with my girlfriend on the back and a fair load of kit, and the bike was as heavy as I’d feel safe with. So would imagine, that’s a good indication of what it’ll feel like when I’m finally on the road (sadly my girlfriend can’t come, as she’s the little’un still only 10). Bjorn left for Germany yesterday, and I’ve got June 1st pencilled in to hit the road. I’m off to France for a few days, after which I’m turning left and heading across Europe in your tyre tracks. Me n’ Bjorn are meeting up in Turkey at the end of June, but between now and then have a shed-load of stuff to get done. Me and hubby are from Segamat, currently residing in Malacca. If i am not mistaken, you are related to Tony Kua. Tony and i studied together from primary right upto secondary. Have lost touch with Tony after he left for UK, and i guess he is in France now. Do send my regards to him if chance permits. My best wishes to you and a wonderful journey. Sheen Kua (TONY) is actually making the trip himself ….. write to him here. He will be passing by Malacca on his way down to JB …..
Hey Tony or rather Sheen, didnt know you have changed yr name. It’s me Mala, we go back a long way remember, Segamat primary and secondary school days, how you always use to tease me. Anyway, my husband was browsing the net and he came upon your website, and i said, this guy sure looks familiar and true enough it is you. Well i am settled in Malacca and with three sons age 21, 18 and 15. Do drop me a line and if time permits look me up when passing through Malacca. Bravo pour cette exceptionnelle aventure que partage une exceptionnelle famille. Comme disait Serge de la chorale,quelle superbe preuve d’amour ! i have just read your iran report and saw the pics. i was bit jealous. i cant wait until next year to start my little trip. hope you the best on the road! enjoy!!! How is it in Bishkek? Hello Sheen, it was great to meet you in Samarkand. Congratulations on the trip, the entertaining blog, the great photos, the good humour, the patience with a coach-load of would-be travellers. As soon as I’ve scanned the photos I took of you leaving for Tashkent I’ll pass them on to you, and in the meantime, best wishes for the journey ahead. I’m looking forward to the next instalments! Keep it up. I’ll be watching you!! I’ve talked to more fans here in BJ and they said you can come over if you want with the permit or temperary visa stamped when you enter the border. Any way have good time and I’ll trade you with meals for your stories next time you come. Bravo, allez jusqu’au bout de vos rêves, génial, époustouflant! Pensée “musicale” vous accompagne pour ce périple. First time I react on your weblog, but words cannot express how much I enjoy your stories and pictures. I’m probably not the first to tell you, but what the h… where you doing in an office all these years ?!? There must be dozens of television program makers that would love to broadcast your travels and reports. Not to mention your fantastic pictures. Really, you should do something with your talent. Think about it when you finish this journey… Until you do, learn as much as you can from all different cultures, people and their lives. Being healthy and able to do what you are doing leads to real richdom in life and worth much more than collecting materialistic things such as money. Take care my friend and enjoy every minute ! I was following you from the begining and I must say photos from central Asia are great. Very different from Monaco isn’t it? I wish you good luck for the rest of your journey and enjoy. I finally have the photos I took of you as you were leaving Samarkand… if I put them here: http://thomaseagle.com/sheen.zip (it will weigh 5MB) you can download them when you like/can! you are one of the few bikers who enters chine that i have seen so far!! you have done it!!! congrad. really. hope you and the bike is well. save journey! I applaud your spirit of adventure. I saw you passing through Saddar Bazaar yesterday and was left in a state of almost crippling stupefication. I actually ended up following you to your hotel hoping to have a word with you once you stepped outside again. Alas, such was not to be. It was only after I left that I realized that such clandestine behavior on my part might have freaked you out a bit. If such is the case, I most humbly apologize. You are truly on a journey of a lifetime. I am mesmerized by your blog entries and your outstanding photography. You are truly an example for us all. Thanks for the inspiration. One day I hope to follow in your tiretracks. For now however, I will remain a strong supporter and will be keenly reading your blog updates. Stay strong. If you happen to find yourself in a spot of bother while you are in the Islamabad/Pindi area, do not hesitate to get in touch. Best of luck for your onward journey. P.S. Kuda is unbelievably pretty. I am the one who try to attempt a record for around the world with motorbike last year. Glad to see got another person, which are you to do the same things. Hopefully can see you when you arrive in Malaysia. Can you contact me or let me know when you will be at Malaysia. I really interested to see you. My contact number is 017-6081709 or email mambo_uitm@yahoo.com . Keep in touch bro. The feats that you have achieved and experienced have made me so humble. You have truly made Malaysia proud. 1. What is the camera you are having? 2. Any problems with entry visa to each country that you have visited? 3. How much money you have spent so far? Thank you and all the best to your continuing endeavor. so far so good. i am sure you are enjoying every singe minute of your journey. i hope you save and nice drive in india. just wanna say so proud of you and wish you reach segamat safely…. You are doing really good. Wish I had the chance to do this. And I like your bike. Keep up the great work. One up for the server boys in Segamat. Make sure you bring your bike to St Philips. Congratulations! It must be very exciting. One would have to be adventurous and resourceful to tackle such a feat. Definitely a positive attitude. Not to mention a boss who is cool when you take a multi-month sabatical! I too grew up in Segamat. Being a small town, everyone shares the same history. Yes, I was a server boy too at St. Phillip and attended Segamat HS. It was my brother Francis who is in NZ that sent me the heads up to your adventure. I’m very happy that he did. It just gives me more courage to possibly do my own one day. If I may say, if you get the chance it may be a good idea to switch to synthetic motor oil. It does not breakdown as easy and can easily last 2x longer. And for your vinyl seat, since you are already on the road, if you can find some beaded seat cutouts or even sheepskin as a layer. They will keep you cooler and possibly help remove any pressure points or hot spots. My 1200RT was that way too. The pressure points hurt me more than the heat and therefore I had to get a custom seat with a stiffer cushion. My riding buddy on a 1150RT (a much leaner person) only needed a beaded seat to extend his riding distance and comfort. The sheepskin does get dirty on such trips and may not be the right application. Although I live in the US, if I may be of assistance, let me know. Really admire of what u are doing now. A bit jealous though. Anyway, i am staying somewhere near thailand border. Bukit Kayu Hitam to be exact. Hope to see your around here soon. Wish to talk more about your journey..coz i am planning for same ride somehere around year 2012or mabye 2013. From UK to Msia. Really need those advise and recommendation for ‘the pioneer’. Anyway..we do that ler huh. Just enjoy your ride. And i do agree with you..Turkiye are amazing. I can’t believe it after reading the guestbook comments. Mala Yap – I believe we may all have gone to school together in Segamat High School and Primary E. School????????? one word for u buddy ” Marvelous” ! WOW…your photo :camping near the river with mountains background really superb. BRAVO…BRAVO..
Dont worry about losing the fish, i belanja u ikan bakar kuala perlis. I am truly amazed and enchanted by all the pictures you had taken. Fantastic collection. Each picture tells a beautiful story and the person taking the shot! Look forward to many more, especially your next collection of Thailand. Save trip back to Malaysia. Heard you’re in KL now. How was the dinner? Have a safe trip down to Segamat. CONGRATULATIONS to you and your super Kuda for the safe and successful completion of this 1st leg adventure. I am sure your BIG achievement has indeed inspired many people out there, young and old and people of all races with your courage, endurance and enthusiasm. We are all proud of you… SEGAMAT BOY. You did it..
See you soon in Singapore.. SELAMAT! Congratulations!! My mother told me you were going to arrive in M’sia very soon and I think you already have arrived. I have checked your photos and they are really nice. It’s a shame we won’t be seeing you this summer. Hopefully in Australia?? I wish you a very nice time in M’sia with lots of food :). Bravo pour ton beau voyage. Les photos sont magnifiques. Un “roulé au Nutella” t’attend pour ton retour ! Well done Sheen, the first leg is completed, what an acheivement – you must be on top of the world! Photos are fantastic, I’ve been living the journey at the same time. Have a good rest, enjoy your family and look after Kuda! Don’t forget the LSU dinner is on August 9. I’m sure some of us would want to get your autograph including me and my kids. I’m very happy for you because you are about to be reunited with your family. Taking a deep bow and standing ovation. A remarkable achievement. This trip must have given you more wisdom and a better understanding about different people and their lifes, which is most valuable to set priorities and make decisions in your future life. I admit, I am a bit jealous, but as said taking a deep bow my friend.. I am glad you drop by n enjoy the ‘cempedak goreng’. Thanks for giving me a change to test ride your kuda… Well, what can i say, you brought her all the way from France, surely i will do the test ride. Geting more xcited for my turn though. C U When I C U..
Je suıs Paul. l un des deux francaıs rencontre a Kaschgar (le plus grand!) en moto 125! enfın l ıran sans carnet de voyage….sans probleme dıeu mercı! nous avons utilise ta carte. mercı encore. elle fut vite epuıse mais en payant 4 fois le prıx nous pouvions faıre le plein malgre tout! nous sommes a 1 journee d Ankara…le bosphore se rapproche! Et toi . tu en es ou? It is Rachid and Mod. Do you remember we met in Krabi, Thailand, with our friends Abraham and Maria. We are now in France. We are currently staying in paris the time we find an accomodation. And what about you ? I believe you are in Malaysia with your family. Your trip to Malaysia inspired us a lot and we decided that we must undertake a similar project to enjoy our life fully. Ok, we don’t know yet where we want to go and how we gonna go, but at this moment it does not matter, the important is to have to inspiration and you gave it to us. So we are very greatful to you for that Sheen. Thanks for the inspiration and the impulsion. We hope to see you again, maybe in france or abroad, who knows. Only mountains don’t meet each other, so we will definitely see you again one day or another. Take care of yourself and give our regards to your family. Bravo… for having made it safely to Segamat.Many Congratulations, not only to you,but also to Lydia,Jade,Pearl and Gem on your Great Achievement; and for their love, support and encouragement.Now, it’s ‘resting,’ time,he ? Wishing you all a Happy Reunion, and enjoy your stay in Malaysia,also meeting up with our family there ,and friends. Take care. God Bless. BRAVO mate!!! Congratulations on your achievement! I’ve been reading all your journey experiences and i luv the photos you’ve taken. I think you arrived at the right time as the DURIAN season is in! Enjoy your stay and my well wishes to your family. hope you are well and still enjoying your trip. i have just seen that you put our names to the thanks page of your website. thanks for doing that. you and your family are always welcome! -Hi Sheen hope you are enjoying your time back at your home town. I see your route in Indonesia are you intending to go all the way down the trans Flores higway (in reality a twisting potholed narrow peice of road) to Alor or are you just going to Lomboc or Sumbawa Cant tell from your map the scale is to small. If you need any info on Indonesia just ask we go there often and if I cant answer I can probabally find info for you. Great blog by the way. hurraayyy!! you’ve achieved the first part of your dream! congratulations to you and to your family, who have supported you all the way to Malaysia. wish you a good time with your family over there and hope you the best for the second leg of the trip!! I am glad you are back home. Still admiring you and hope you will cherish and use the wisdom you gain along the way. It would be great if you could find an agency who will publish a book about your journey and experiences. I would be proud to receive a signed copy. Life is short, enjoy every minute my friend. My name is Clement and I was born in Nice (I know Gattiere…). I am traveling with the same Dakar then you, and my girl friend has a GS. We are in Cambogia now, and waiting to go to Tibel/Nepal with a group (Kete). My favorite place in Asia is Malaysia! We start our trip in the Philippines about 8 month ago, so if we can help you with some contacts or places to stay on your way, just let me know! I wish you a safe trip and take care! Anything is possible if you follow your heart. Superbe voyage! suis en palnning = pouvez-vous me contacter par email? 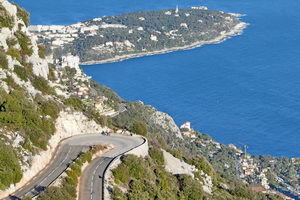 Great site, came across it while researching my trip from Cambodia to Europe by bike, some great hints and tips. Hi Sheen when are you off on the second leg, great Indonesian route by the way see you aim for Derawan and Sangalaki as well as Sipadan are you diving there. Diving is good in Alore as well, (We just snorkel) We will be in Sumba, Lombok and Bali mid February to Mid March if you are around that way maybe tie in for a bite to eat and a beer if our paths cross. Hello and thx your messages. Am out there again. Back on the road since 4 days and currently in Songkla, Thailand. Heading north, doing the loop. – PS To Dave : should be crossing your path out on the islands in Feb. Thinking of you as you go on the road again. Lucky you , being in the tropics – it’s freezing cold in Europe !! Anyway, enjoy yr. journey, and take care. Just saw that you are on your second leg. Enjoy yourself. Will you be in Malaysia at all during the CNY? Maybe the rest of the primary/secondary school friends could meet up with you. Just saw the pictures taken at Gunung Ledang! So beautiful and right at our doorstep too! Cant wait to see all those wonderful pictures along the way. Take care and have a lovely trip. Thx msg. Good weather (hot!) while heading north to Chiang Mai. Will be updating this site soon. Judie, expect to be around Segt & KL for CNY a few days only, then off to E.Msia & Kalimantan. Good occasion to meet up. Have not met some of the school friends on the list since school days. Nice to hear from you. Have fun in Thailand. Our family will be spending CNY in Batu Pahat but will return to K.L. on Thursday. We’ll be visiting some friends. I hope you get to meet our LSU friends. Chiengmai! Make sure you take a loop around Mai Chiem, Pai and Mai Hong san – vert hilly and lots of hilltribe villages around there. Dont forget to get some pens and sweets for the hill tribe villagers! Amazing place. I read an email of a CNY gathering at Kim Tiew’s home on 3rd day of CNY – 28 Jan… if you are around Segt at that time, you might be able to catch some of the high school friends! I will email you details. I have been reading about your trip and I have similar plan in mind. Can you tell me who you used for your paperwork in China and if you were able to drive on your own in China? Hope to hear from you and safe travel. I drove on my own about 10 days in Xinjiang province. Its possible to arrange that. Will send you info on your email later this evening soon as I cross into Laos in next 2 hours, I hope. Happy Chinese New Year to u! Currently i am having holidays at Sibu, Sarawak(my wife’s hometown). Will back to Penisular Malaysia on 29th Feb.
Glad to see u back in action! All the best and hope u enjoy ur marvelous trip ahead! Hi, Je prepare un voyage tres similaire depuis la france jusqu’a l’Inde (ou je reside) comprenant un crochet” en Chine via KK highway. Depart fin Mai sur une 100 GS. 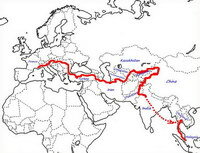 Comment as-tu gere ton visa et ton entree en Chine avec la moto? Emmanuel. How is your English? I am going to do something similar in the same time. Perhaps we can connect and drive sometime together? Hi Sheen, I’m not a RTWer..yet but I’ve been into bikes and travel from a very early age. Although at 29 now i’m in the dilemma of getting on the property ladder and seeing what the recession brings or saving a little cash, packing in the job and heading into the sunset. I got to your site via HU and reading everyones stories is very motivational…I never realised there were so many people biking rtw!! Hello All, good to hear from you, thx your messages ! Salut Emmanuel, je t’enverrais info à ton email bientôt. Dis moi les pays que tu veux traverser. Comme Emmanuel et Michel Jongens, je prépare un voyage similaire au tien – départ de Paris début avril pour terminer à Katmandou mi août. Toutes mes félicitations pour ton blog, il est bien riche en info. Si tu balances un email à Emmanuel sur ton agent pour la Chine, je suis preneur ! Encore bravo et bonne route ! We are two polish journalist, planing RTW trip this may. There is a problem with ridding own bike in China. Can you tell us who you used for your paperwork in China and how it must be done to ride own motorbike in China. Hoping You answer soon. Hope to hear from you and safe travel.We folowing Your trip and keep finger crossed. Verifier vos mails, j’ai repondu a vos questions sur la chine. Check your mails, replied to your questions ref entry with bike into china. ce passe bien et que tu n’a plus de problème avec ta moto. tu est encore a Krabi? Comment vas tu? j’espère que ton voyage se passe toujours bien, et surtout que tu en profites. Tu nous manque à Nice! Tu rentres en mars? Pour moi ca va, je suis en train de finir tout mes exams et projets pour les cours avant de commencer mon stage. j’ai hâte d’être en stage ca va être bien! Si tu peux donnes moi des nouvelels sinon ben j’en prendrais auprès de Lydia et sur ton site! Be leaving the unit tommorrow I was going to be on Sumba for 13th but the Flight is cancelled (worse than CDG which has just been shut for 14 hrs) so should be there on 15th now stay for iweek to 10 days. I see that Suumba is not on your route anyway. After that we will be back in Lombok for a couple of weeks finally returning to Bali for the last couple of days before being back to Equatorial Guinea departing Indonesia on the mourning of 9th March. So if your any of those places around then drop me a line and we could do a beer and a bite. By the way no Internet in Sumba so dont expect a reply while I am there. Where are you now by the way. Hei brother remember me? i am the fella whom we met at Mtechnik in singapore the one thats riding BMW R1100RT.Good luck in your adventure riding remember my slogan”you must got BALLS to do what you d”. I remember you mentioned something abt riding to boneo, this is the website that would take you ride in the forested area. I have tried it on my honda dominator 650. It was one hell of a ride so if you intend to give it a try here is the website http://www.BorneoBikingAdventures.com, Tel:0135527313,Adress:Kota Kinabalu 88812 PO Box 11185,Malaysia Borneo. cheers my frend and enjoy. Hi Sheen hope all is going well for you. We have had a change of plans and will not now be in Lombok Only Bali from the 4th March. (Best laid Indonesian plans as they say) we couldnt get off Sumba so took a flight to Maumere in Eastern Flores (on your route) up till then. We will stay round this way now as its real nice If you are down this way at that time drop me a mail. I can see you are not in Bali yet as the web postings are getting old and pleanty of access on Bali. Sorry to have missed your call on Skype, I did try to call you back but you had gone offline, how’s it going? I imagine you are having a ball, while the rest of us are struggling to make a living(lol), The truth is I’m jealous as hell, I would love to jump on a bike & take off without a care in the world, I look forward to hearing from you, meanwhile I’m going to follow your exploits on your website. Hi Sheen, very envy you have an adventurous journey..wish u a safe journey! incredible as is the narrative of the trip – and enjoy !! Bagaimana surat dalam Bahasa Melayu???? 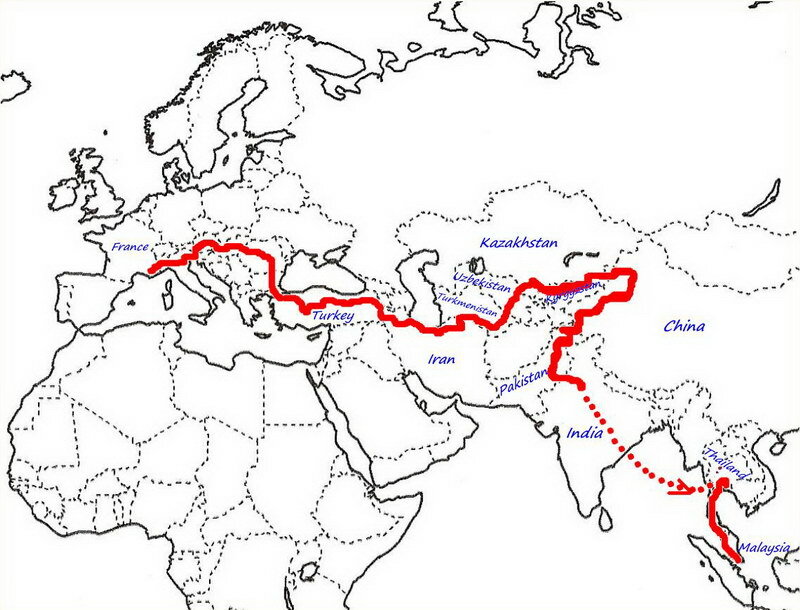 I am from Australia… Sydney… My wife (Nikki) and I are planning a similar trip via Harley in SE Asia as well. Tapi.. tidak yang seberani perjalananmu!. Don’t worry.. I am an Aussie!! I just speak a Indo.. thertefore a bit of Malay… Would love to welcome you into Australia when you get here. We are in Sydney. But it will have to be before July 2009, as that is when we start our own adventure… Would be good to catch up and share notes. We are going to cover much of the same ground. When you come across Perth W.A. drop us a line on our email, so we can meet for beer! je peux enfin te faire un bisou car je squatte un ordi. contente de voir que ton voyage se deroule bien, tes photo sont toujours aussi belles. 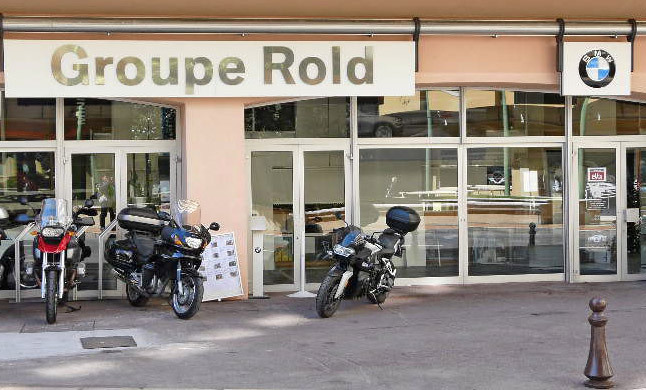 tes problemes de moto sont ils resolus? à bientot à ton retour pour entendre les recit de tes aventures. ta belle soeur qui t’embrasse. Congratulations for achieving your dream! You completed your journey to Australia in such a short time. You are truly amazing! Looking forward to more stories and pictures. Have a great time with your family and LSU friends. Pastinya suatu hari nanti saya juga akan ikut buat kerja “gila” seperti ini.Yessssss!! I will! Harapnya kita dapat berkongsi pengalaman terutamanya berkenaan urusan-urusan dokumentasi. Kuala Lumpur ke Eropah pastinya akan menjadi kenyataan. this is Toni. We met shortly at a hotel somewhere between Probolingo and Mount Bromo mid of March. I was at this hotel with my girl friend Verena for food and you where actually staying there. You then asked us about the road conditions and places to stay around Mount Bromo. I hope you remember. Anyhow, we got back from our holidays today and I finally found the time to look over your site. I haven’t seen all yet but the pictures taken in Kalimantan are superb !! Really really great and adventurous. You actually told us about the mud and the heavy rain. But I didn’t picture it that hard. I really like what you are doing. Respect ! Carry on. Hi Sheen, hope you are well. Firstly thanks for the big lunch! I didn’t eat dinner whatsoever but I’m still full. Even a glass of coke won’t fit in right now :). Just want to wish you all the best in your last leg of the journey. You’re a great guy and it was all my pleasure to have met you. Duddy and Lukman said hi as well. Still can’t call my dad to pass your regards until now, haha, but I’ll keep trying. I was just looking at the pictures you have taken from France to Kalimantan, and those were awesome. I thought you said you couldn’t take good pictures, but those were great. Alright then, catch you sometimes later. C T sympa ce repas a Ubud chez Cedric. On espère que tu es arrivé au bout de ton aventure comme prévu. On est de retour en France en attendant un prochain voyage. Sympa de voir les photos de ton voyage. Tous les jours, j’attends avec hate le compte rendu de Pearl !!! J’attends les photos d’Australie avec impatience !!! Des bisous et joyeuses paques de toute la famille Gilabert. hello sheen tu est ou? a tu mange du Kangourous? How is it now? I had a great time with you driving together from Port Fairy to Robe and eventually to Adelaide. I just arrived after a great weekend at Port Lincoln. In the next days I am trying to sell my motorbike and prepare myself to go back to The Netherlands, this Sunday. All the best with your travels. Hope everything goes well. just read about your biking trip and am really glad to see that a malaysian boy is doing this 🙂 i only recently started taking lessons for my motorcycle license here in singapore as well. all the best for the rest of the journey!! holler if you drop by singapore anytime in the future. You should have joined the Tour de France last month. They need people like you there. Take time to relax your mind. It might improve your concentration to write better and to remember everything that happened during your journey. Keep inspiring people. Hi there.Iam considering a trip smilar to yours in late 2010 onthe same bike.Did you buy your Jesse panniers in Europe?The duty to have them shipped into the EU is very high.Do you know of a european distributor for them and any ideas on how to lower a Dakar without messing up the handling.I am very short. Enjoyed your site very much. I have only stumbled upon your website, and congratulations on your amazing accomplishment! We grew up in Segamat together (same primary school, church), and lost touched after that. I have always idolized your sense of adventure, so it is no surprise what you have accomplished. You make us all proud! Best regards, hope to catch up via email soon, and God Bless! P/S From the many guestbook messages, regards to Peter Kua. Also regards to Mr Abraham – not sure if you remember me. Mala S – hello! I read with envy your travel notes in Part 1. Have yet to continue reading Part 2. Just found your website not long ago. The pictures are great and you have good story telling skills…. I am a Malaysian, now working on a rotational basis in Tripoli, Libya. My dream is to fly my GS1200 from KL to Tripoli one day, and ride it back to KL. Will need some tips from you when the time comes. If you can contact me via the email I would be grateful. comment ca va ? on attend la suite … ta perdu les photos??? allo cedric, où est-tu, tj à java ?? content d’avoir tes nouvelles. je t’enverrai un mail perso. Hey bro, which you a happy new year and looking forward to see you in Langkawi. By the way, we are selling our motorcycles and yacht and planning to go to Europe next summer and ride the new 800 to Africa. We are looking forward to talk to you and see if you can join us for a bit of ride (to Spain at least!!!). I’m desperately jealous of your trip! 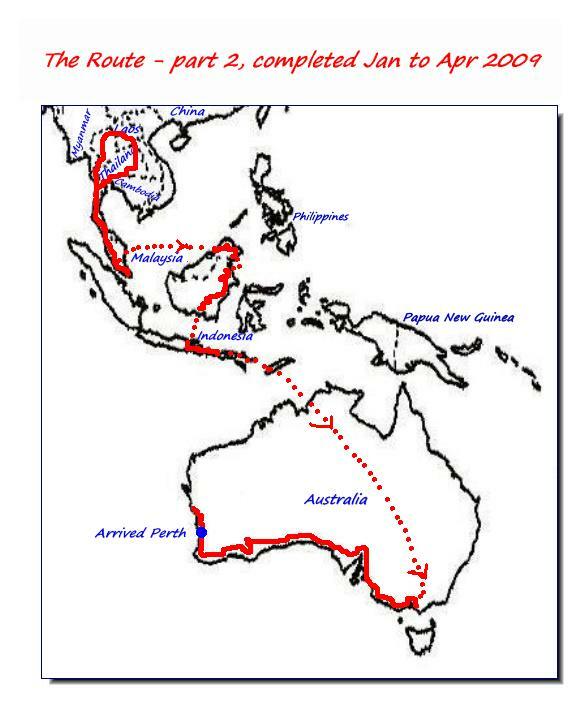 I will be making one that roughly corresponds to your part 2 in a few months (riding from Sydney to Borneo, with ferry crossings when required). I’m interested in two specific legs of your journey (a) shipping from KL to Borneo – can you post contact details for the freight company? (b) ferry from Kalminantan to Java – what was your departure port and did you have any trouble getting the bike on the ferry? I am traveling with bike through Eurasia and when I went direction Taraz, he just stopped and invited me directly. At first I declined 2 times, but he really wants me to be his guest and i am spending a beautiful time here. Furthermore he always told of your trip and brought me to write this message 😀 really funny, I even must smile while writing. Kasachstan is beautiful, i didn’t made some bad experience since now, hoping that this wouldn’t change. Have a nice trip and good luck. You’re a lucky person to be have met up with Mr. Suyunduk. When I stopped him in Taraz to ask for a mini-hotel, he invited me to his home. He’s a wonderful man, very very hospitable. We are in contact by mail. Pls send my very best regards to both him and his family. Khazakstan is a great place to be on a bike. Enjoy your trip. Btw, are you heading into Krygystan, although I hear there’s a bit of tension there ? If you get to Bishkek, check out a little guesthouse called Nomad, you’ll enjoy your stay there … and say hello to Urmat & Raisa for me. Thx. What’s up? It seems you have forgotten something. What happended to Slideshow Video part 2? It’s O.K. if you cannot finish it yet. I understand your situation. I suppose you are too busy with your other projects. I had forgotten you already got other work to do. I am sure other people are also expecting the conclusion to this story. I will continue reading your blog as I find it very interesting. I saw You on TV. And the reason why I payed attention to you is that I also want to do a trip by bike(i am now just 18 y.o.). I want to stay in contact with you and maybe one day to join you. If it is possible please write me to my e-mail. Really a thrilling travel. I studied in Gilgit some twenty years back. I appriciate your courage. hi sheen..nice to knowing u ..if u have next trip to borneo[tawau] let me know..k have a nice day..ride on ride safe..
I’ve got a Dakar too, but haven’t seen a toolbox like that. What kind of toolbox is that? Sorry if that info is listed somewhere obvious – I couldn’t find it. Looks like some great adventures! This toolbox is a great accessory – very robust, holds my repair kits & tools, always got such with me wherever I go. Toolbox is made to be bolted onto the engine protection guard. You can order it from a UK company – I’ll send you the contact if you’re interested. 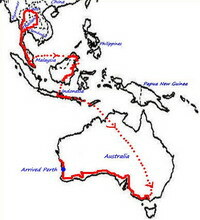 Hi Sheen, Just found this site after making search on overland route around Borneo. I am planning a circumvent round borneo trip and in process of preparation of route. It must have been a satisfying feat for you. Btw I found your photos very interesting and intend to make short movie on it just so that others planning similar trip get to see what is coming much faster. I seek your permission to use your borneo’s images to turn to video. Hope you approve. (It is not for commercial use). The crossing between Tawau / Indonesia is a bit tricky, so good luck to your plannings. It would be interesting to include jungle track routes. You’re welcome to use my Borneo photos for non commercial purposes. i am in java at the moment and looking at doing a similar route to you guys up through kalimantan and into malasia via the same crossing. my only concern is that i cannot find out any information on ferrys or boats going from west malasia to malasian borneo. how did you manage it? are there regular ferries of did you have to charter a boat? Hi Rob, are you heading up from Java into East Kalimantan, then into Tawau city on West Malaysia state of Sabah ? Are you travelling on your own (bus/taxi)or on a motobike ? If on your own, catch bus or private taxis from Samarinda to Nunukan. It’s a 450km distance jungle path but may take 3days to a week as when it rains you have to get down to push through muddy roads, and be prepared to sleep sitting up in vehicule & night drivings. It’s an adventure on its own. There are daily passengers ferries from Nunukan to Tawau. If on motobike, it’s a different story at crossing, will advise if required. sorry, should have been more specific. im doing it by motorcycle. Best option for motobike is the shortest sea crossing ie from Nunukan to Tawau, Sabah. This is the far west of Borneo, passenger ferries don’t carry vehicules nor equipped to carry heavy load. From here you have to locate / negotiate with someone willing to bring your motobike across in a small boat right up to the Malaysian customs port in Tawau (anywhere else would be illegal or at least not unload until customs give clearence entry to do so). Note : no loading / unloading facilities on both side. I had to hire a crane on the Tawau side. So good luck, any question private mail me. that sounds perfect. a little bit of an extra challenge haha. thanks for the information. also, how did you manage to get from west malasia (on the mainland) to Sarawak? i cant seem to find any information on ferries or boats that run between both halves of Malaysia. There are no ferries between East & West M’sia. It’s quite simple and reasonable costs to just fly it to West Malaysia from Kota Kinabalu or Kuching via MasCargo or Transmile cargo. Twice weekly cargo flights, I think. No crating required, just push your bike into cargo area, do paperworks, leave it and you can pick it up in KL at their cargo centre. Btw, in Nunukan it’s a hornets nest (like on Tarakan island which I would not recommend to go) with lots of “bandits” in disguise from officials customs / police to men just praying on tourists. At best get a reputable local agency to do the crossing job. Good luck. At Tawau M’sian customs side they may ask you to show the Carnet. Happy he who like Ulysses (Sheen) has returned successful from his travels; This trip will be for ever one of your best moment. Hi Paul, thanks, yes – great trip and momemts still v.fresh in mind. PS : am back at SBM.